After the latest round of failed peace talks and the enduring settlement construction, President Abbas has threatened "to end Palestinian self rule"
Abbas' threat is a "trump card"
Palestinian President Mahmoud Abbas threatened to dissolve the Palestinian Authority (PA) if Israel does not stop building settlements on occupied Palestinian land, he told Palestinian television before heading to Turkey and Athens. "If Israel does not stop settlement building and if US support for the negotiations collapses, I will strive to end Palestinian self-rule in the occupied territories," he said. "I cannot be the president of a non-existent authority as long as Israeli occupation of the West Bank continues," he said. Dismantling the PA would be a last resort, Abbas told Palestine TV in an interview broadcast late Friday. However, his comments marked the most explicit warning to date, indicating that he's considering a step that could crush lingering hopes for a Mid-East peace deal. 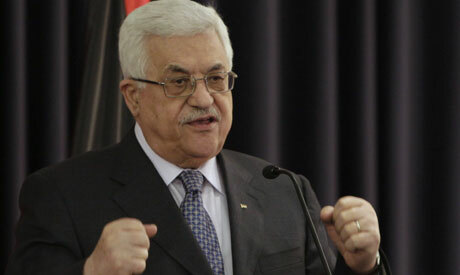 When asked if his statement was in reference to the PA in the West Bank, Abbas said: "I say that to the Israelis. I inform them that, as occupiers, they can stay put. But the situation cannot remain unchanged." If Abbas were to take such a step, Israel, as a military occupier, would have to assume full responsibility again for 2.2 million Palestinians in the West Bank. Israel was relieved of that financial burden with the establishment of the PA in 1994, as part of an interim peace deal. The 1993 Oslo peace accords launched the peace process and led to the creation of the PA, a body tasked with governing parts of the West Bank and Gaza Strip until an agreement could be reached. But it won’t be as easy as it sounds for the Palestinian president. Abbas might face considerable domestic opposition to dismantling the Palestinian Authority, since it employs some 150,000 Palestinians, a large chunk of the work force. The Palestinian self-rule government, which receives hundreds of millions of dollars a year in foreign aid, has limited authority over 40 per cent of the war-torn West Bank, while Israel has final say over the entire area and exclusive control over 60 per cent of the land. Recent talks were futile; Israel and the Palestinians are far from reaching an agreement. Direct talks resumed on 2 September but were deadlocked soon after, following the expiration of an Israeli moratorium on settlement building in the occupied territories. Abbas has repeatedly threatened to quit the talks if Israel does not begin a new freeze, particularly in east Jerusalem which the Palestinians want as the capital of their future state. Abbas repeated again his threat for the unilateral declaration of a Palestinian state saying that if all efforts fail, Abbas said, "I will tell the Americans and the Israelis, come and put an end to all this. I can't continue like this. We have an occupation and we don't. No, keep it all and release me (from my responsibility)."